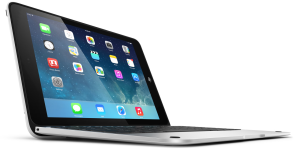 Be a trendsetter with the ClamCase Pro iPad Air 2 Keyboard Case. Snapping seamlessly onto your Apple iPad 2 Air, the Clamcase Pro adds stylish protection and a responsive, bluetooth keyboard that increases productivity and mobility in a matter of seconds. Thanks to ClamCase’s patented 360-degree rotating design, this innovative keyboard can also serve as a tablet stand or simple cover. With Big Apple Buddy, you can now buy the Clamcase Pro direct from the USA and have it shipped to you anywhere in the world. You’ll love the feel of the ClamCase Pro’s crisp keystrokes and roomy QWERTY keyboard design. The full keyboard includes shift, command and control keys that are sometimes left out of condensed portable keyboards. There are even keys for the home screen, search, on-screen keyboard, media device, lock, Siri, and more. In addition, the elevated, island keyboard doesn’t cramp the keys so you can enjoy greater precision and accuracy. When you aren’t banging out emails or writing proposals, simply fold back your ClamCase Pro to share a presentation or watch movies and interact with your favorite app. The ClamCase Pro's rotating hinge doubles as a convenient tablet stand for easy viewing at any angle. The keyboard automatically wakes or sleeps as you rotate the case, so you’ll never have to worry about accidentally bumping keys or draining your battery when not in use. 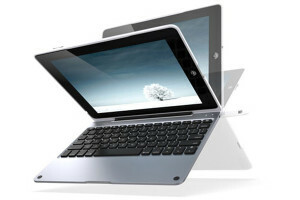 The ClamCase Pro is one of the best tablet keyboards on the market, and has a retail price of US$169. Order through Big Apple Buddy and we'll pass on our exclusive rate of US$129. We know you work in a global world. Big Apple Buddy’s international shipping service can help you buy the ClamCase Pro for the iPad 2 and ship it to your doorstep, anywhere in the world. Big Apple Buddy offers fast and secure delivery to Singapore, Hong Kong, Malaysia, Maldives, Germany, New Zealand, South Africa, Denmark, Sweden, Slovakia, Estonia, UK, Slovenia, Italy, Brazil, Norway, the Netherlands, Indonesia, the UAE, Israel, Japan and more. If you would like to buy the ClamCase Pro for the iPad Air 2 but need help with international shipping, simply contact us for a free quote!